We are the Nunavik Inuit publishing house. Our publications feature works by and about Inuit and the north- with an emphasis on giving a voice to Inuit and the subjects that touch Inuit and the North today. Our collections are designed to inspire and encourage a new and positive discourse on the history, present day and future of Inuit, through memoirs, academic works, youth writing and books that touch on our common experiences of the human condition. Avataq Cultural Institute has a three-decade history of publishing important reference works on Inuit and the north. 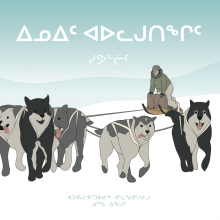 These books and other publications offered in three languages (Inuktitut, French and English), were produced in small quantities and made available for Inuit in Nunavik. In these pages you will find excerpts of oral histories from Inuit elders, information on traditional kinship ties and land-use, Inuit child-rearing practices, medicinal plants of the north and much more. You will also discover back-issues of the popular Inuit cultural magazine Tumivut. The Government of Québec’s ministère de la Culture, des Communications et de la Condition féminine, which, through its operating assistance granted to the Insitute since 1984, contributed to the affirmation of the identity and cultural vitality of the Nunavik Inuit.